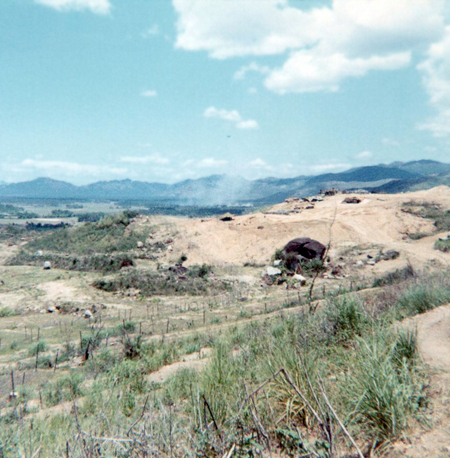 EARLY JULY, 1967 — During the last few days of June and the first few days of July 1967, the 1st Platoon of A Company, 1/8 Cav was working out of LZ Geronimo. During the day time we would go out on search and destroy missions and, after returning to the LZ, we would send out an OP (observation or listening post) every night. The OP would consist of three soldiers with their M-16 rifles and an AN/PRC-25 radio. Late one afternoon, shortly after returning to LZ Geronimo, two members of my platoon and I were told to report to Platoon Sergeant Prock because we were assigned to pull the OP duty for that evening. I was really unhappy with this duty because we had just returned to the LZ from a tough, all day long search and destroy mission on which we had to walk up and down hills in 103° temperature while fighting through all the heavy foliage. Then, we got back to LZ Geronimo about two hours before I had to get ready for the OP. I was hot, sweaty and really tired, and I had hoped I would be able to pull guard duty and sleep in a bunker inside the LZ instead of on the ground approximately 100 meters outside the LZ. Additionally, I had been having a tickle in my throat, causing me to cough frequently, and I was afraid that my noise caused by my coughing would give our position away to any enemy elements that may be in the area. Sergeant Prock told us to take a light load with us instead of the approximately 70 pounds of ammo and equipment we humped when we were on search and destroy or cordon and search missions. We would take our M-16, about 200 rounds of ammo, our canteens, four grenades, our poncho, air mattress, and the PRC-25 radio. He also told us that we could set up our own schedule, but at least one person was to be awake and on guard duty at all times, and we were to inform the platoon RTO of any suspicious sounds we heard or movement we observed. He also informed us that the soldier who was on guard duty was to keep the headset of the radio close enough to his ear that he could hear the static that was constantly audible when no one was talking on that frequency. Sergeant Prock also informed us that periodically during the night, Ralph Ricedorf, his RTO, or Richard Waller, Lieutenant Pape’s RTO, would depress and then release the squelch button on the radio, which would cause the static noise to cease and no sound could be heard on the radio while the button was depressed. When the soldier on guard duty noticed the silence, he was to depress and release the squelch button twice to let the RTO know that he was awake and all members of the OP were in no danger. If the RTO did not hear the proper response with his first depression of the squelch button, he would wait a couple of minutes and depress the squelch button again. He would continue this procedure several times, or until he received the proper response. He then told us that anyone who fell asleep while on guard duty would have hell to pay when we returned to the LZ the next morning. Each of us returned to our squad, ate our dinner, and gathered the items we would take with us on the OP. At dusk, shortly before it got too dark to see, we gathered and decided that, since we would be out on the OP for a total of nine hours, the three of us would each pull two one hour and a half watches. I asked for and was allowed to pull the first watch. We then walked to the area of the fence line where we could make our way through the maze of concertina and barbed wire and exit from the security of the LZ. After we made our way out of the fence line, we walked approximately 75 to 100 meters and settled in a flat area that had enough open space for all three of us to lay down on our air mattresses and still have some space between each of us. The other two guys laid down and went to sleep while I sat down next to the radio and placed the handle on my shoulder so I could hear the static. After being on guard duty for about 30 minutes, I was getting bored and fidgety so I decided to smoke a cigarette. As each of us smokers were instructed when we first joined the platoon, I opened up my poncho and covered my head, shoulders, and upper torso with it so the light produced by the lighter and the lit cigarette would be minimized. I then put a cigarette in my mouth, lit it with my cigarette lighter and took a couple of puffs. I then removed the poncho from my head so I could see, but I was careful to keep the cigarette beneath the poncho so the light would be minimized. I kept putting the poncho over my head, shoulders, and torso each time I took a drag so the light from the cigarette would be barely visible. I finished smoking the cigarette and was careful to make certain that I put it completely out so no light could be seen, and so I would not set any of foliage on fire. Since my head was under the poncho to light and smoke the cigarette, it took several minutes before my sight could adjust back to the darkness. 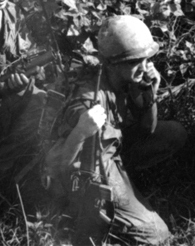 I also thought about how stupid I was to light up and smoke a cigarette because I was taking a chance of illuminating our position to any enemy soldier who might be within 100 meters or so of our location. And, if the light wasn’t very visible, the smell of the tobacco could also give away our position. Taking a chance on getting killed just so I could smoke a cigarette showed me just how powerful my addiction to cigarettes really was. After I had been on guard duty for somewhere around one hour, I heard the static on the radio stop for about a second, then the noise of the static returned. I knew that was either Richard Waller or Ralph Ricedorf, the Platoon Leader or Platoon Sergeant RTO, checking to make certain we were awake and safe. I followed the correct procedure and depressed and released the squelch button on the radio twice to let Waller know everything was okay. My one and a half hour watch finally ended and I woke up my relief and laid down for my three hours of sleep before I had to pull my second watch. Right on schedule, I was awoken three hours later so I could pull my second guard shift. I was really struggling to wake up because my first guard duty ended at 2250 hrs. (10:30 p.m.) and it was now 0130 hrs. (1:30 a.m.), and I had to be awake and alert for the next hour and a half. I decided to smoke a cigarette to see if that would help me to be more awake and alert. I went through all the proper procedures of smoking, but it didn’t help much at all. On top of that, I had a tickle in my throat and had coughed several times after I was woken for my guard shift. I had to fight back the urge to cough, but I continued to cough sporadically. I muffled the sound of my coughing as best as I could so the noise would be as quiet as possible. I tried changing the position of my head to see if it would help stop the drainage into my throat. After being on guard for approximately one hour, I finally discovered that the only way to stop the coughing was to be prone on the ground. I didn’t want to give away our position by making so much noise coughing, so I decided to lay down. About one and a half or two hours later, one of the other guys shook me, woke me up and asked me if I had fallen asleep while I was on guard duty. I was startled by being woken up that way, as well as realizing that I had, indeed, fallen asleep while I was on my watch. Of course, the RTO had sent the squelch message many time with no response, which was all my fault, and I knew I was going to be in serious trouble with Platoon Sergeant Prock when we returned to the LZ. I tried rationalizing my mistake by telling the other two guys that laying down was the only way I could stop coughing, and I didn’t want to give away our position with all the noise I was making. Since I had fallen asleep on my watch, the other two guys informed me that I would stay on guard duty until we returned to the LZ in less than two hours. I did stay awake, and I responded to the squelch alerts from the RTO. At dawn, approximately 0600 hrs. when it was light enough for us to see, we began to make our way back to the LZ. We radioed the platoon RTO to let him know we were on our way back, and for him to tell the guys who were guarding the perimeter not to shoot us as we approached the wire. The RTO informed us that we were to report to Sergeant Prock immediately after returning to LZ Geronimo. We weaved our way through the maze of concertina and barbed wire, entered the LZ, and made our way to Sergeant Prock’s position. After reporting in, Sergeant Prock learned that I was the one who had fallen asleep on guard duty. He had several choice words for me, and he would have none of my excuses about trying to keep from coughing. He told all three of us that, because I had fallen asleep on my watch, all three of us would go out on the OP again that evening. Of course, that made the other two guys really upset with me because I was the reason we had to pull this lousy duty two nights in a row. Our platoon went on another search and destroy mission that lasted the entire day and, the same as the day before, we made our way up and down the hills, struggling with the heavy foliage and the 102° temperature. We arrived back at LZ Geronimo at approximately 1800 hrs. (6:00 p.m.), had a hot meal, and was able to rest for a little more than an hour before reporting to Sergeant Prock. He gave us basically the same instructions as the previous evening, but he also gave me an excellent piece of advice. He told me that, if I did find myself struggling to stay awake, the surest way to make certain that I would not fall asleep was to assume the front leaning rest position, which is the beginning position for pushups with the arms in a straight, vertical position and both hands and all the toes on the ground. I really appreciated his advice, and I was very glad that he spoke to me in a pleasant, encouraging tone of voice. We saddled up with the same amount of ammo and equipment as the previous night and made our way through the opening in the maze of concertina and barbed wire. We again walked between 75 and 100 meters before finding an appropriate position to set up for the night. I asked for the first guard shift again but the other two told me that, since I fell asleep on my watch the previous night, I was going to pull the second watch. That meant I would get less than one and a half hours of sleep before being awoken to pull my first guard duty. I decided to have a smoke before going to sleep, so I went through the proper precautions to minimize the amount of light that would be visible as I lit and smoked a cigarette. As I puffed on the cigarette I just couldn’t stop wondering just how much light was visible through the poncho, and just how much danger I was causing myself and the other two guys just so I could satisfy my addiction. But, I just finished my cigarette, stuffed it out, and went to sleep. I was awoken at 2230 hrs. (10:30 p.m.) to pull my one and a half hour guard duty. I sat up, moved over close to the radio, and placed the hand set close enough to my ear that I could hear the static. I made a lot of body movements, including raising and lowering my arms, leaning left and right and forward and back, moving my legs, and other motions to keep me from dozing off. I was determined not to fall asleep again on this OP duty because I didn’t want to be the cause of the three of us having to pull OP duty three nights in a row. Just like the previous night, I had some coughing spells, but they were not as long or as often. About half way through my duty I went through all the precautions and smoked another cigarette. Then, with a little less than 30 minutes remaining on my shift, I heard the brief silence on the headset. I promptly depressed and released the squelch button twice to acknowledge the signal from the RTO and advise him that I was awake and we were safe. I felt a tremendous sense of relief knowing that I would make it through my first watch without falling asleep. At 2400 hrs., midnight, I woke the guy who would relieve me, and I laid down and went to sleep. This time I would get a full three hours of sleep before having to pull my second guard duty. Right on schedule, I was woken at 0300 hrs. to pull my second guard duty. Very similar to my first shift, I smoked a cigarette and then went through the ritual of making a lot of body movements to keep me awake. I coughed a few times, but resisted the temptation to lay down because I was absolutely not going to take any chances of falling asleep again. The RTO again checked to see if I was awake, and I responded letting him know I was awake and all three of us were safe. I finished my one and a half hour shift and woke my relief at 0430 hrs. so he could pull the last guard duty, then I laid on my air mattress and went to sleep. We gathered our equipment and started making our way back to LZ Geronimo at first light, which again was approximately 0600 hrs. We radioed the RTO to let him know we were on our way back, and for him to alert the guys who were on guard duty not to shoot us. I reported back to my squad, had a cup of coffee, ate a C Ration for breakfast, and prepared myself for the search and destroy mission assigned to us for the day. I also was thrilled that I would not have to pull OP duty again in the foreseeable future, and I hoped my coughing would stop before then. As a side note, a little more than a year later while stationed at Fort Hood, Texas, I was informed that, because I was a smoker, I suffered from Chronic Bronchitis, which caused my periodic coughing spells. See the Chronology for this period and the Map links given there.